Operating in potentially hazardous environments means health & safety is paramount throughout our operation. 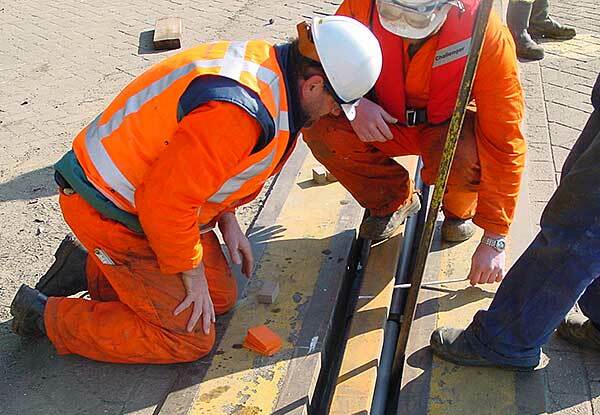 Rapid rail are committed to compliance to the highest standards of safety legislation. Rapid Rail insist on the highest Health & Safety Standards for all staff whatever their responsibilities or working environment. Office staff as well as site engineers co-operate to ensure safe working systems at all times and in all places. Rapid Rail ensure good training, communication and compliance in all areas of Health & Safety. Daily we incorporate our Health & Safety Management System, recently registered as OHAS18001, in all company activities. Just as technology is moving fast, we are continually moving on and improving our Health & Safety compliance to ensure we are up to speed and up to date. Currently we are working towards our Safe Contractor Accreditation for a further Health & Safety Award. A safe working environment is Rapid Rail’s top priority, for both clients and staff. We also streamline operations to limit the impact we have on the environment and to reduce our carbon footprint, wherever possible. Rapid Rail have an excellent safety record throughout two decades of working hands-on in safety critical environments and on potentially hazardous sites. We have put good communications and regular feedback in place with staff, clients and suppliers, to ensure continuous safety improvement throughout each aspect of our business. Working closely with clients, we use any feedback they supply or that we have learnt from different sites. Rapid Rail hold regular meetings with staff to distribute all the policies, risk assessments and method statements. We also communicate via emails and contract briefings. All staff have electronic access to documentation via our central server. Our detailed Health & Safety Policy Statement is available at Head Office or can be downloaded from our website for all staff and Stakeholders to view at any time. Staff training and development is a key component of Rapid Rail’s delivery of excellence for our clients and safe working for our staff. As part of recruitment, induction and ongoing professional training, company members are drilled in the critical importance of Health & Safety in general and in specific systems needed for their own responsibilities. The fundamental core principles in Health & Safety are an essential minimum requirement. We believe this is a critical part of our excellent safety record and one of the core factors in ensuring staff well being and company progress in the short and longer term. Please consult our Design and Consultancy Service to ensure the correct Crane Rail System and application, or Contact us +44 (0)1452 383001.